You Can Use Edible Cake Images To Design Birthday Cakes For Kids And Adults. It's easy to create your very own homemade birthday cake and it's easy to make it look like a professional baker made it...but your family and friends will know you did it! You can find everything you need to top your cake with a cake image that matches your party theme. 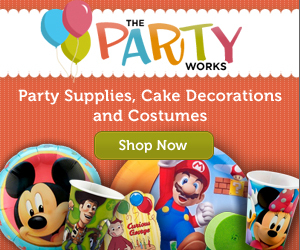 The Party Works is an online party supplies and cake decorating store where you can find the help and the ideas you need to create a fabulous cake for your next party or holiday. They have just about everything you could want or need for a party. It's not difficult at all when you use an edible image to top your cake. All you need to do is lay the topper right on your iced cake making sure to place it where you want it. It's not like making and rolling, molding, cutting and sculpting you would have to do when you are working with a more complicated cake decorating medium like fondant or gum paste. You can use an edible image and even if it's the first time, your cake will look great! But there are so many more to pick from...see if your theme is there! At the Party Works you can also find lots of fun party ideas. Take a look at their website before you start planning your party to get some great ideas about themes and supplies. Find the information you need quickly and get the party planning help you need today.